You don’t even have to leave the airport to see that Hurricane Maria has laid waste to Puerto Rico’s power grid. On Friday, the San Juan airport was abandoned. No electricity meant no air conditioning, and no air conditioning meant hot and muggy air wafting through the terminals. Ceilings were leaking. Floors were wet. Only the military, relying on its own sight and radar systems, was landing planes. The airport is one of the first places crews will restore power -- whenever they can get to it. Hundreds are still waiting for the all-clear to move in and start the arduous task of resurrecting Puerto Rico’s grid. 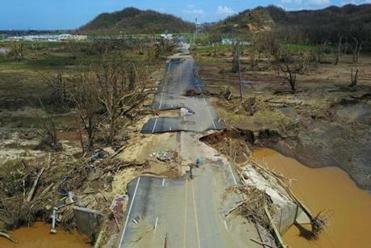 The devastation that Maria exacted on Puerto Rico’s aging and grossly neglected electricity system when it slammed ashore as a Category 4 storm two days ago is unprecedented -- not just for the island but for all of the U.S. One hundred percent of the system run by the Puerto Rico Power Authority is offline, because Maria damaged every part of it. The territory is facing weeks, if not months, without service as utility workers repair power plants and lines that were already falling apart. “I have seen a lot damage in the 32 years that I have been in this business, and from this particular perspective, it’s about as large a scale damage as I have ever seen,” said Wendul G. Hagler II, a brigadier general in the National Guard, which is assisting in the response. 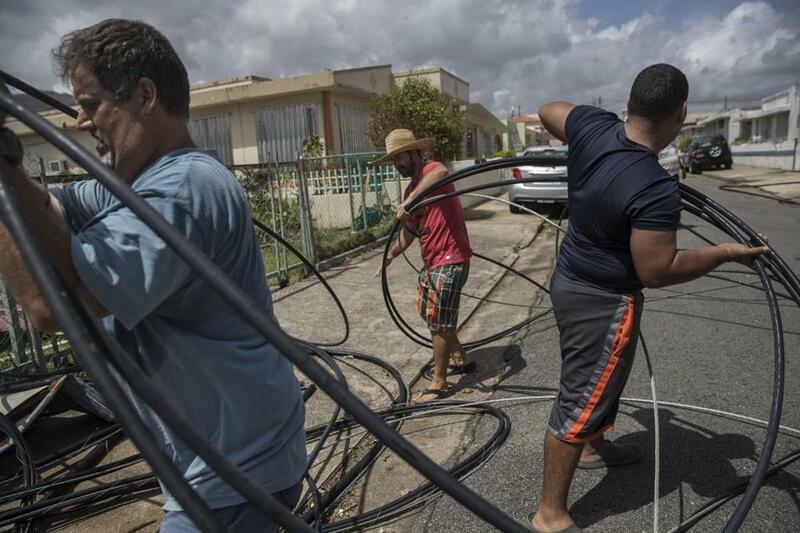 No federal agency dared on Friday to estimate how long it’ll take to re-energize Puerto Rico. If it’s any indication of how far they’ve gotten, the island’s power authority known as Prepa is only now starting to assess the damage. “Lives are at risk. We’re American citizens just like you,” one resident said. Neighbors David Riefkohl (left), Charles Yates (center) and Jose Nieve (right) cleared downed power lines from their block in Yabucoa, Puerto Rico on Sunday. What Buell does know is Puerto Rico’s power plants seem inexplicably clustered along the island’s south coast, a hard-to-reach region that was left completely exposed to all of Maria’s wrath. A chain of high-voltage lines thrown across the island’s mountainous middle connect those plants to the cities in the north. Puerto Rico’s rich hydropower resources have also taken a hit. On Friday, the National Weather Service pleaded for people to evacuate an area in the northwest corner of the island after a dam burst. “All areas surrounding the Guajataca River should evacuate NOW. Their lives are in DANGER!,” the service said on Twitter. And that’s not to mention the state of Puerto Rico’s grid before the storm. Government-owned Prepa, operating under court protection from creditors, has more than $8 billion in debt but little to show for it. Even before the storm, outages were common, and the median plant age is 44 years, more than twice the industry average. 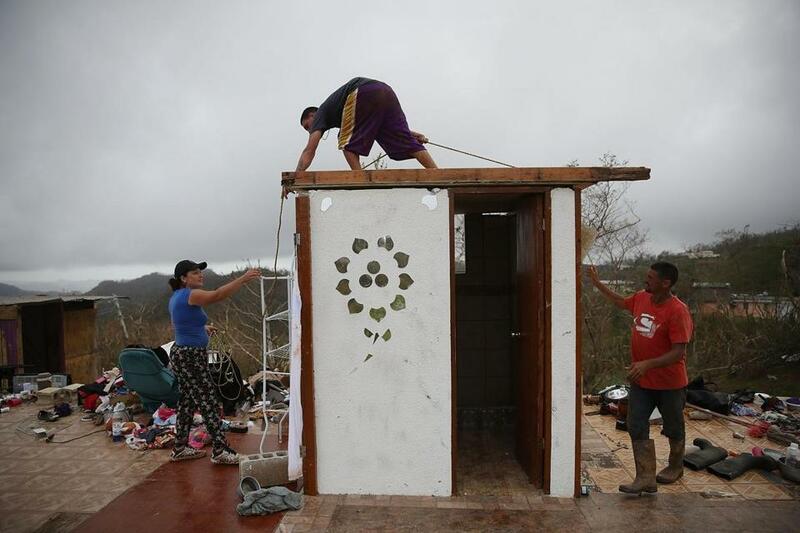 Carmen Maldonado, Jose Flores and Carlos Flores (left to right) put a temporary roof the bathroom which is all that is left of their home. Buell is a part of what is known as the Emergency Support Function No. 12. That’s another way of saying his team is 12th on a list of groups getting priority access to the island to help with restoration efforts. They’re behind the ones that, among other things, are delivering food and water and carrying out search-and-rescue missions. One major task for the National Guard will be to clear debris, allowing workers to move around. The biggest priority for utility crews will be to restore power to essential services -- the airport, water infrastructure and hospitals, Buell said. It won’t be easy. The supply chains the island once relied on to shuttle fuel oil and natural gas to generators, supplying the vast majority of the island’s power, have been destroyed. The Energy Department is looking for alternative sources, Buell said. Some agencies are capable of flying in fuel, and the government may waive a law that limits the tankers permitted to haul oil and liquefied natural gas between U.S. ports to boost shipments to the island. Once critical resources have regained power, crews will start the long process of getting power plants back up and running and transmission lines reconnected. New York Governor Andrew Cuomo flew in Friday with 10 people from the state’s own public power authority, drones and back-up generators. A helicopter was scheduled to fly out as soon as Saturday to assess the damage to the system, said Mike Hyland, senior vice president of engineering services for the American Public Power Association, the industry group for municipal utilities. 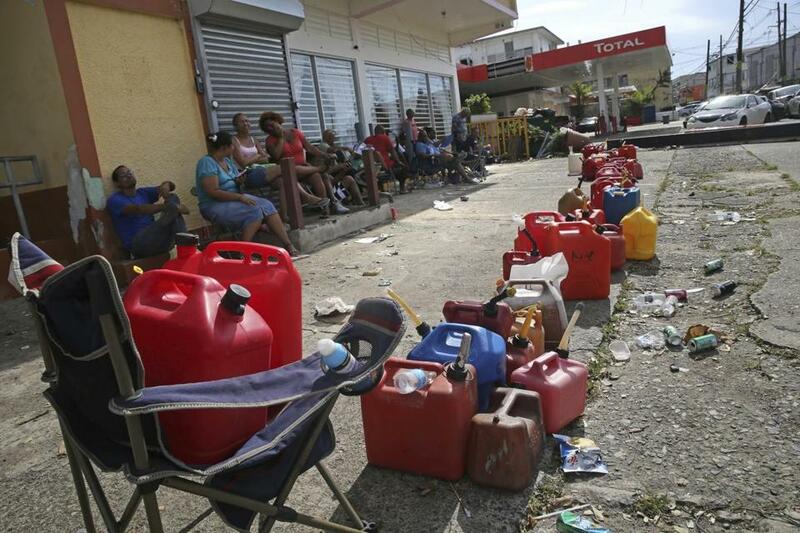 Residents lined up gas cans as they waited for a gas truck to service an empty gas station.